We’ve got our mojo back! It’s incredible what a day doing nothing but eating and wandering (without bags), and eating, can do for the soul. We awoke craving the trail. We wanted to be running again, climbing, finding the highs and lows, dodging cows and sheep, searching for markers…we wanted to get back out there. But first, we wanted coffee and petit dejeuner. 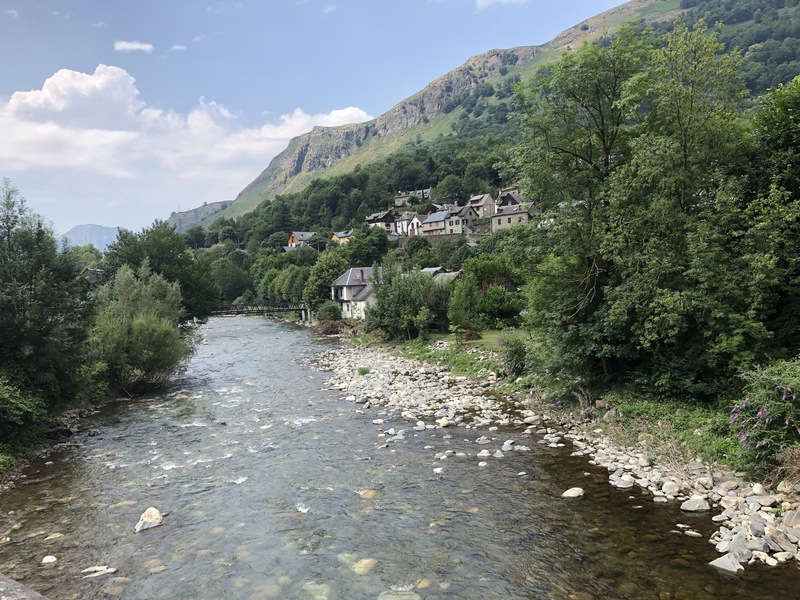 Bidding our hotel goodbye and with our bags laden with goodies for the next few days, we started gradually winding along the river out of Luchon. Within the hour, we were climbing and it felt good. 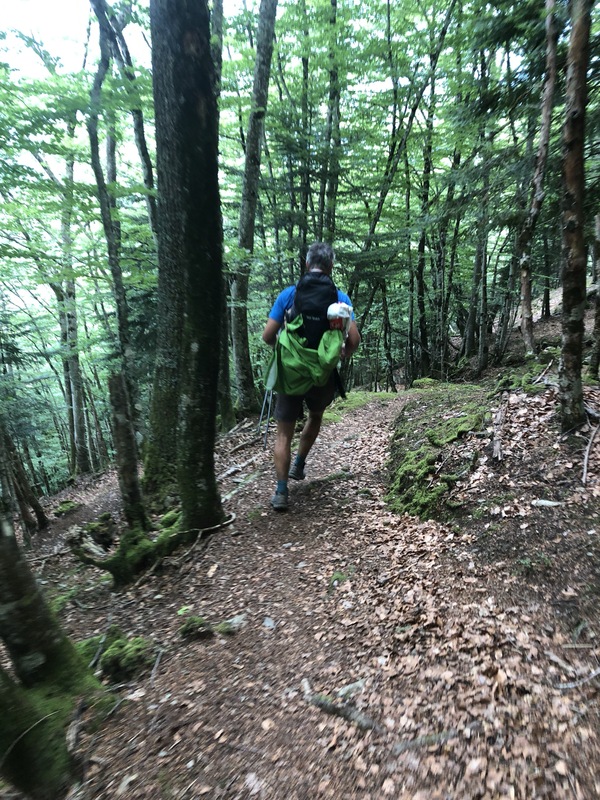 Through a forest, we climbed through the tiny villages of Sode and Artigue, watching cats scamper as Mat tried without success to hold back his gas. Turns out a day of carb-loading is one day too many for his digestive system. I secured my spot in front of Mat for the rest of the climb. Three hours flew by and we were looking far far down at the town and the clouds below. A quick swig of apple juice and we continued up. 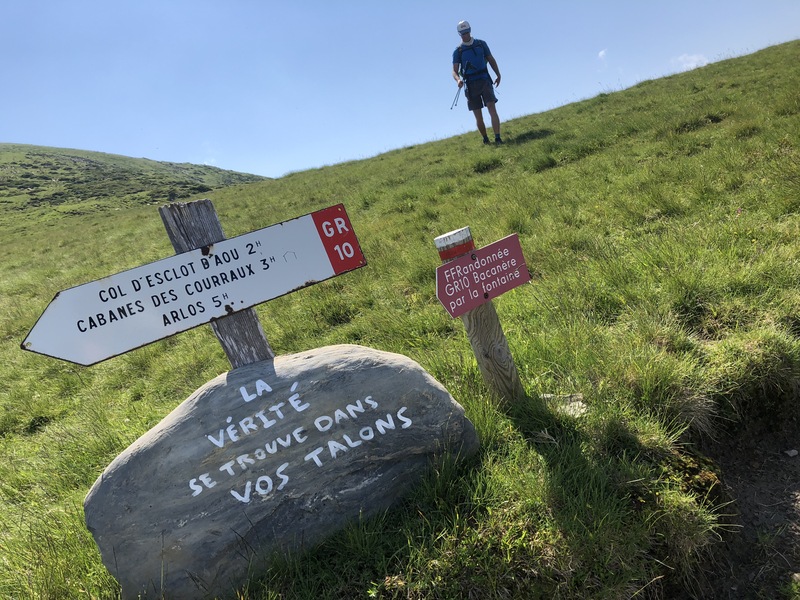 Today, we were heading into the Ariege – a famously remote section of the trail, and the Pyrenees for that matter. We were skirting around the Spanish-French border too, not that there are any signs telling you. The only hint we are close to the border is the fact that some signs are now in Catalan as well as French. Not that it really helped us. So about that remoteness. This is a big deal on the GR10. Until now, we’ve been comforted knowing that we are never more than a day from a freshly-baked baguette. We have been dropping from mountains into villages and back over mountains again. That changes here. We’ll have days of not going anywhere near villages, and those we do go through may be desolate and without shops. Look, this might have changed over the years, as more hikers are seeing the appeal of the rugged landscape. But it means we need to be more organised with our food and water. We need to carry more. 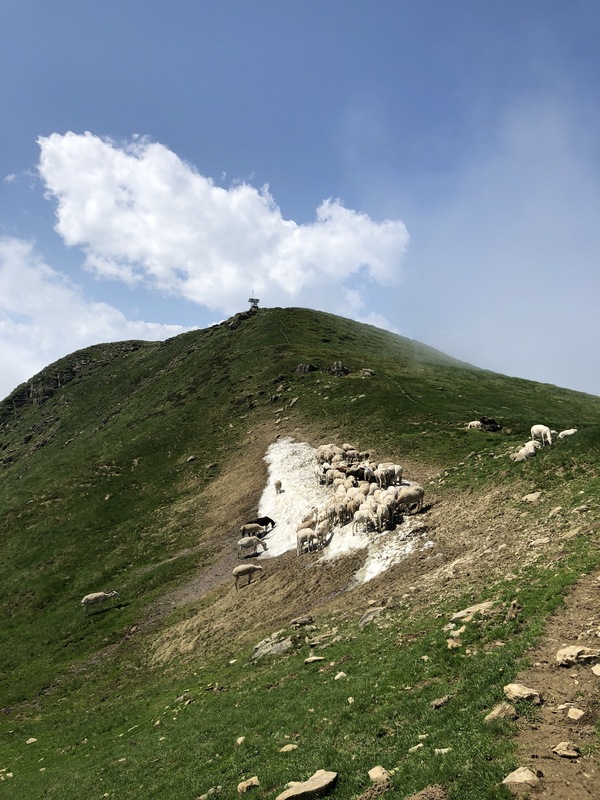 We were really feeling the extra weight as we hiked up the final Col at 2018m. (But that could also have been last night’s chip sandwich…). 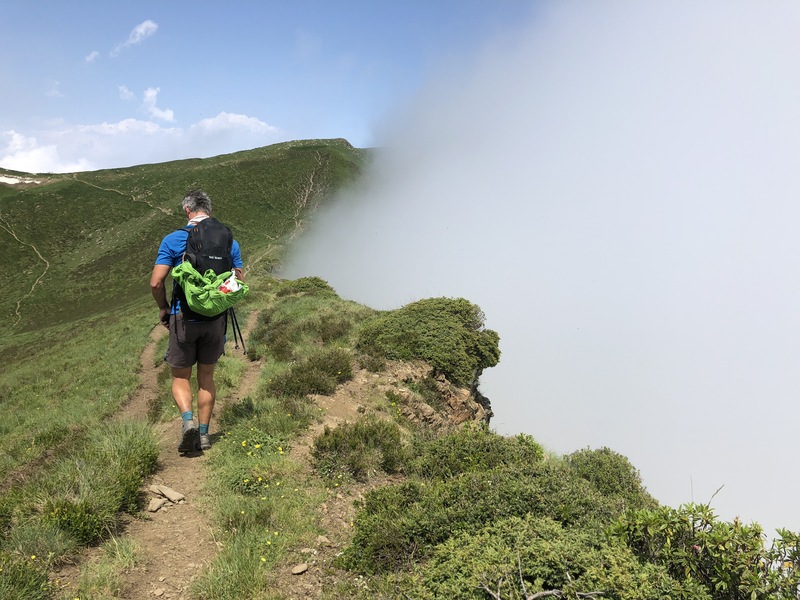 Above the clouds now, we missed a turn but quickly rerouted down the hill, past a duo of crumbling stone cabins and some angry cows. Then, it was deep into the woods and running. Zig-zagging down down down, we bounced over mattresses of leaves for over an hour until screeching to a stop at the bottom. We’d reached Fos. Fos is a tired, tranquil village on the border of Spain. According to the enigmatic Corsican bartender who moved here for a sea change 10 months ago, the town used to have thousands of inhabitants doing trade across the border, marked by an old customs box. There are now 200 villagers. Every second house, while beautiful, is marked with “A vendre” (for sale). 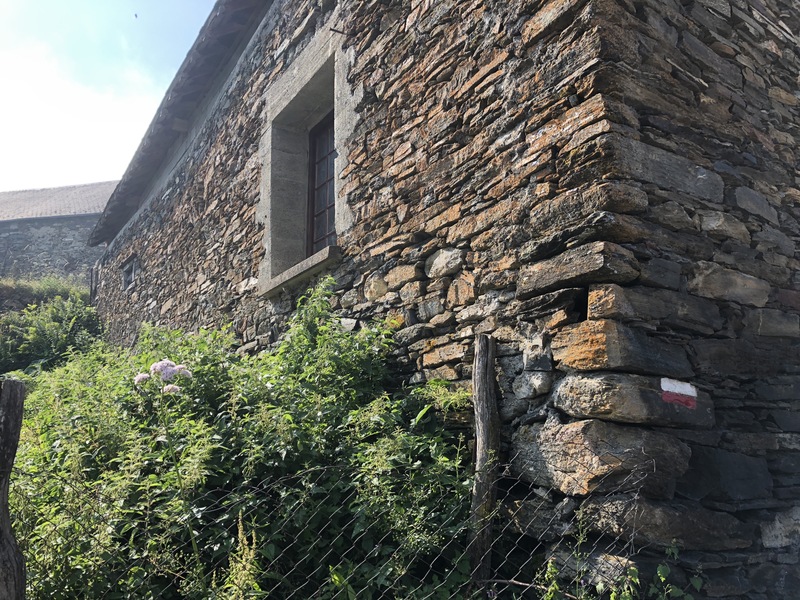 We found a stunning farmhouse for 47,000 euros. I can see why a sea change would be attractive! 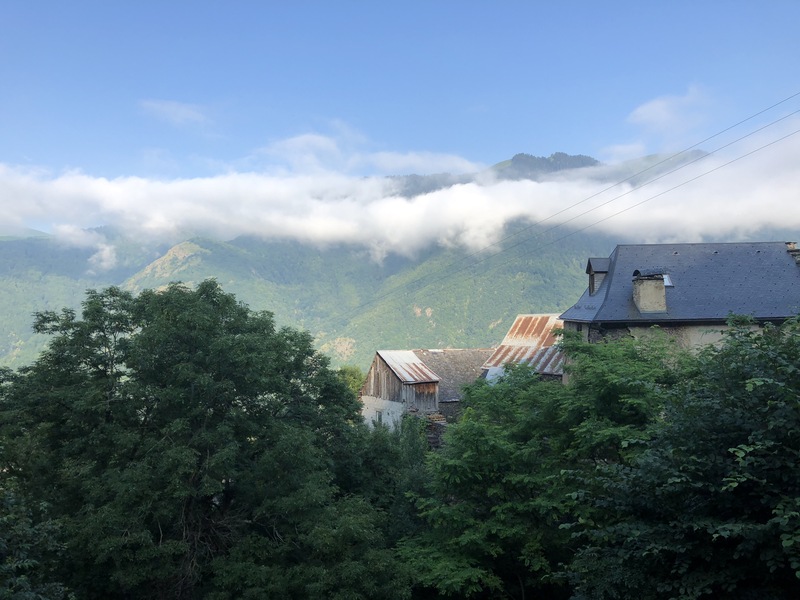 Aside from La Gentihommiere, one little bar-hotel which two best friends from Corsica revived, and a hidden gite for hikers, there are no services in the village. The barman is selling us a baguette in the morning and we’re camping in the big village green next to what seems to be a disused school. The school is unlocked so we (and the five Dutch hikers we’re camping next to) can use the toilets and cold shower – perfect on a muggy day like today. There’s already a lot to like about the Ariege. Day 1 Easter run hike camp extravaganza! !